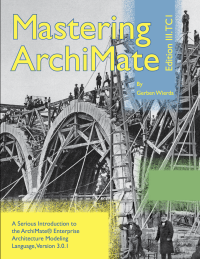 The PDF version of the third edition of the book Mastering ArchiMate, by Gerben Wierda, has just been made available. This new edition has been updated to align with the most recent version of ArchiMate. The book gives an introduction to the language, then goes on to show you key aspects of successful modeling, and many different patterns for its use. From Business to Infrastructure, from Risk & Security to Application Exploitation and Maintenance. While the aim of the book is to teach the language, it often also offers necessary background, so that the patterns can make sense to the reader not familiar with a subject. We regard this book as required reading for those who are new to the ArchiMate language and an essential addition to the library for those architects who are familiar with ArchiMate modelling. If you’ve just downloaded Archi and don’t know where to start, grab yourself a copy of the book now. If you’re an old hand, or already own the previous edition, we recommend to update your copy. The hard-cover version is planned for October 2017.